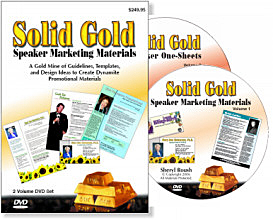 Everything you need to create powerful brochures and marketing pieces. 4 hours, with 200 design samples on PowerPoint. Volume 1 overviews business cards, websites... Volume 2 gives details specifically for one-sheets. For speakers, trainers, coaches, authors, consultants. Easily design your own materials. Understand what your readers need from you - and where to place it in your layout. Includes creativity process and booklet handouts. Filmed for the National Speakers Association.